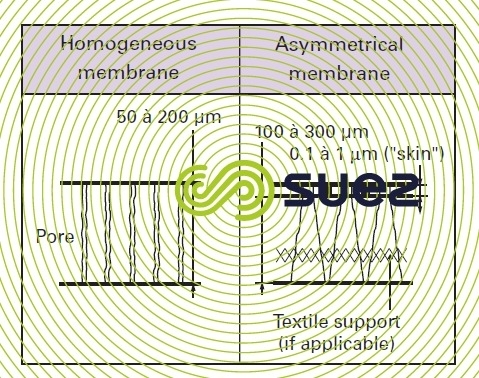 A membrane is any material that, in the form of thin films (0.05 mm to 2 mm), have the property of selectively opposing the transfer of different components found in a liquid or gas fluid and, therefore, allowing certain elements making up this fluid to be separated out (particles, solutes or solvents). Since the first cellulose acetate reverse osmosis membranes appeared on the market, a large number of organic (polymer) or even mineral (obtained, for example, by sintering ceramic granules such as Aℓ203, silicon carbide, zirconia) membranes have gradually been added to the list. They can be identified by their structure (figures 47 and 48). These membranes have the property of a microstructure that is homogenous throughout their thickness. These membranes may be porous or dense. 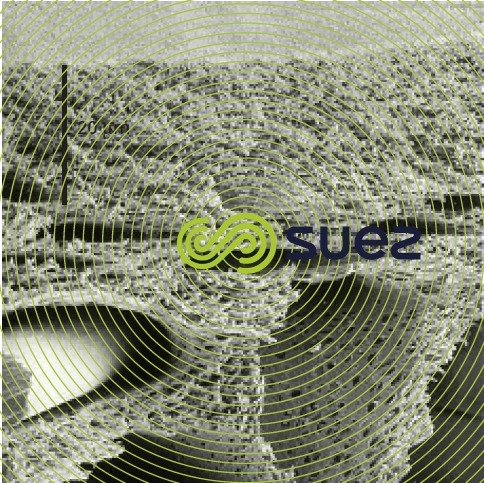 Made from the same material, they consist of two superimposed layers: a very thin "skin" (0.1 to 1 μm) and a much thicker, porous, substratum (100 to 300 μm) that is often reinforced with a textile fabric. The separation properties of these membranes are mainly linked to the properties of the "skin"; the porous substratum provides mechanical strength without resisting matter transfers. When the membranes are made of hollow fibres, we speak of an internal skin if this skin lines the fibre lumen, or of an external skin when the skin is on the outer surface of the fibre. These techniques have appeared more recently and allow an extremely thin film to be formed on an existing porous support which is itself frequently asymmetric. As the two materials used together are different, this allows us to make the best use of the properties of both materials: mechanical in the case of the one and selective in the case of the other. Thus, TFC (Thin Film Composite) osmosis membranes have a polyamide semi permeable layer well below 1 µm laid over a substrate which will often be a polysulphone ultrafiltration membrane. These mechanisms can be separated into four groups (figure 49). The solution or the suspension is concentrated by allowing water through selectively (solvent transfer by convection through a porous medium), whereas the other components of the fluid are held back on the surface of the porous medium, according to the size of these components. Solvents and solutes attach chemically to the membrane and diffuse (migrate) at varying rates under the effect of the pressure gradient and chemical potential. Separation is caused by the velocity differentials observed. A mixture can be fractioned through the selective transfer across the membrane of one of its constituents in its gaseous phase. In dialysis applications, solutes will cross through the membrane more or less selectively; water does not cross through these membranes. The solutes can be neutral or charged. If they are charged (same material as that used in ion exchanging resins and supplied in the form of a sheet), they become selective as far as transporting opposite sign ions is concerned. Thus, we can have cationic membranes that only transfer cations, or anionic membranes that only transfer anions. reverse osmosis membranes are dense skin, asymmetric or composite membranes that let water through while, ideally, rejecting all salts. microfiltration membranes are porous membranes that are most frequently homogenous or slightly asymmetric. Pore sizes are between 100 nm (0.1 μm) and 10 μm. They allow almost every dissolved species through and only retain solid particles. 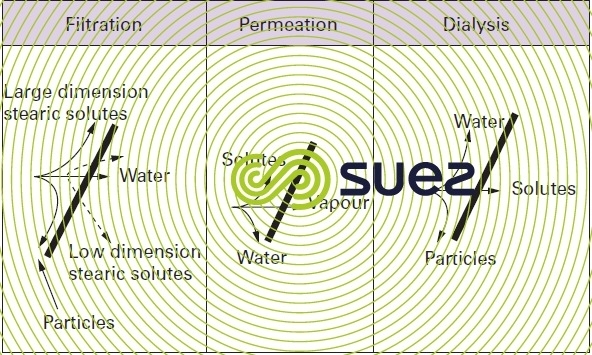 conventional filtration transfer mechanisms (convective transfer of water in a porous medium and filtration/screening of particles that are larger than the pores) that are quite appropriate to microfiltration and to “loose” ultrafiltration become inappropriate to nanofiltration and reverse osmosis membranes where the mechanism is based on diffusion. 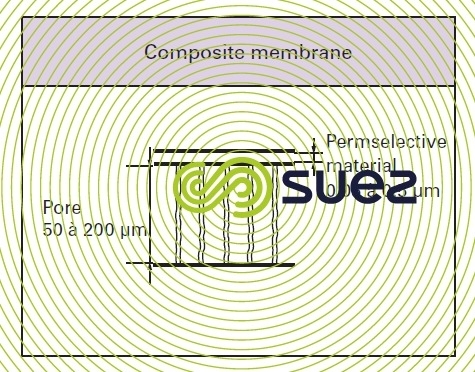 Therefore, for water treatment purposes, we would suggest to distinguish from those membrane the membrane that partly or totally rejecting salts, called desalination membranes and clarification membranes (figure 50 – last line) the one which totally eliminates suspended solids that cause turbidity without altering the water’s saline composition. The former are not much used in water treatment (flow is too low) unlike the loose UF membranes are becoming more and more prevalent; therefore, we shall be describing the latter under the designation of ultrafiltration membranes in the “clarification” membrane paragraph (see clarification membranes).